The article can also be found on the Coaches Toolbox, a collection of free resources for coaches of all sports. This quote is a line from the classic movie 12 Angry Men. During the opening dialogue among jury members, each feeling out their place and role in the deliberation of the fate of a young man’s life, a blue‐collar working man makes this declaration of powerlessness. The implication is that all the power—at least that of “supposing” rests in the hands of his superior. Just a movie? Hardly. It’s been the rule for over a century in team sports to install a hierarchical leadership structure. This is accomplished by appointing a couple of players as team captains (as well as modeled by the hierarchy of the coaching staff). Surely everybody knows that on any sports team only a few players are able to really perform peer leadership. This is the team captain axiom, the basic axiom of traditional team leadership. An axiom, of course, is a truth so self‐evident it doesn’t need to be proved. After all, everybody knows an axiom is accurate and correct. So then, it’s indisputable that you need a pecking order in order to get things done. Not too fast, things are not what they always seem to be on the surface. The bad news is that far too often our intuitive ways of thinking about the world are wrong. Yes, axioms can be wrong. The good news is that it’s possible to set them right. What’s self‐evident, what’s obvious, what everybody knows, has deep roots and of course isn’t in need of change. Yet, paradoxically that which is self‐evident hides something–covers over what might be a deeper truth. Axioms, by their nature, are anti‐learning. Nobody ever questions an axiom. Nobody ever discusses an axiom (save for a few propeller heads). It’s just taken as a given. And nobody ever talks about the possible counterproductive consequences of what everybody knows. The fish, after all, never questions the water he lives in. Then, all of a sudden, someone comes along with a breakthrough idea and turns the old axiom upside down. The taken‐for‐granted truth, it turns out, wasn’t really the truth after all. “The world is flat,” was the truth people lived by for thousands of years. Then, along comes Nicolas Copernicus who proves to the world the old axiom to be wrong. I’ve never been a fan of Kobe Bryant, and I seldom look to professional sports for deep insights and understanding on leadership, but it appears that the wisdom in Bryant’s words fit hand‐inglove with today’s call for a more heartfelt approach to coaching and leading. So what’s the way forward in this brave new world? Don’t worry. While you’ve been trapped in the axiom of team captaincy, I’ve been turning over rocks to find a better way of designing a high‐performing team, its culture, and of course, leadership. I’m not done yet. It might be another decade or so before I’m finished. But this workshop workbook is a start. There has been a long running debate in scholarly circles about whether people learn to lead from their experiences or if leadership is something a person is born with. Today, however, most academics agree that leadership is best considered as a set of skills and qualities that can be learned and developed along within a wide‐range of personal styles. It’s widely agreed that all people have the potential to develop leadership skills. I point this out because it is also clear that leadership is viewed and valued differently by various fields, disciplines, and cultures. So then, what is leadership? This is the big question that every person, group, team, organization, community and society seeks to answer. Our American culture, which of course includes a heavy dose of sporting influence, exalts the lone ranger, the hero, the charismatic leader. We see this in the election and glorifying of politicians, the deifying of business tycoons, and the adoration and idolization of great coaches and athletes. This notion falls in line with the traditional ideas of leadership—that it is the make‐ up of the leader that makes all the difference. Individual determinism has been and will continue to be an easy and favored explanation of things. But traits such as self‐confidence, intelligence, and a can‐do attitude—favored qualities of a leader—do not always predict the effectiveness of a leader; rather, they can be very misleading. However permeable the traditional mental model of leadership seems, it does not provide a path to sustainable effectiveness as it leaves out the detail and nuance of the context in which a leader takes action. It also ignores the fact that it tends to reduce followers to passive participants; resulting in deliberate apathy and often conscious withdrawal from the leadership provided by one’s peer. Careful examination of this aspect of team captaincy suggests it may promote the discounting or dismissing of the potential of all members of the team to learn and perform in a leadership role. 1. Conventional views of leadership are changing. Leadership is not limited to a chosen few; it is an educational component of participation in student‐athletics and must contribute to the growth and development of all athletes. A leader in every locker embraces the potential of all student‐athletes to take on leadership roles now and in the future. 2. Leadership is a relational process. That is, leadership is a socially constructed phenomenon consisting of student‐athletes working together to accomplish something. 3. Team leadership is distributed. Leadership is not the sole responsibility of the coach, coaching staff, or selected team captains. The best team leadership results from the actions and activities of those best positioned to provide leadership contingent on the context. 4. Leadership is a process to create change. Leadership is about making things happen; transforming people and programs. Effective leadership accelerates change. Change is necessary for growth, development, and improvement in performance. 5. Leadership growth and development is personal. There is no time frame related to progressing through stages of development. It’s also recognized that all potential leaders begin at a different starting point. Leaders grow and develop through deliberate practice, informal practice, roles, reflection, and the observation of role models. 6. Leadership is a process that involves followership. All coaches and student‐athletes participating in a leader in every locker understand and embrace both roles—leading and following. Followership implies a relationship to the leader, but does not imply one that places the follower in a less important position. 7. Leadership develops over time. There is no one way to lead. The practice of leadership involves the continual practice of finding the best way to lead with the particular capabilities that the student‐athlete possesses at a specific time, while constantly working to improve and expand those capabilities. Embedded in the seven assumptions above are the four P’s of team leadership. The framework highlights the integration of the four key domains of leadership. The framework answers the question What is Leadership? Leadership is a position, it is a process, and it is performed by a person for a purpose. coordinated way of doing things. Can student‐athletes, including those that don’t possess the so‐called necessary traits, learn a process for doing leadership things? Of course they can. The four P’s, like the compass that they form, are only a tool for answering the question “What is leadership.” Each student‐athlete (and coach too) brings his or her own unique values, skills, experiences, and personality to the leader role; and each student‐athlete has his or her own personal way of making change happen. 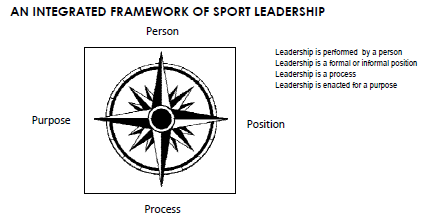 The compass is a simple model that represents the key domains of an effective leadership development program.